There are two categories of vacuum lifters. These are vacuum tube lifters and vacuum grippers. Vacuum Lifting systems based on vacuum tube technology are often used where fast repetitive handling of heavy loads is necessary. 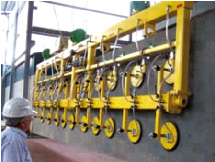 Vacuum Lifting systems based on vacuum grippers are for loads of 100 to 20000kgs. The vacuum lifter is used to grip and lift heavy or awkward loads. To grip a product, the operator rests the suction foot on the surface of the item to be lifted and it is gripped. Lightweight modern designs are used throughout the range we supply. 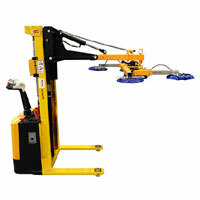 The vacuum lifter works by gripping a load, lifting the load, lowering the load and finally releasing the load. To grip the load the user simply lands the lifter foot on a product to grip it. To lift the gripped load the user gently pulls up the control lever to lift. To lower the load the user gently presses down the control lever to lower the load. Then to release the load the user pushes the lever down fully and tilts the handle to release the load. Vacuum grippers are typically used with larger over head cranes but a dedicated crane is not always necessary as they can be hooked onto the hook of any working crane. Vacuum grippers are useful for lifting coils, glass panels, steel sheets and stone/granite. We supply vacuum lifters for all purposes and industries in Dublin and throughout Ireland. Vacuum lifters are used handling Drums, Sacks, Boxes, Reels, Boards, Doors, White Goods, Pallets, Steel, Glass, Stone and numerous other lifting requirements. Please select one of the following for more details on the vacuum lifters we can supply.